GYEON Renew - 120 ml. Home > Shop by Brand > GYEON Car Care > GYEON Renew - 120 ml. Maintaining paint protection film has never been this easy. 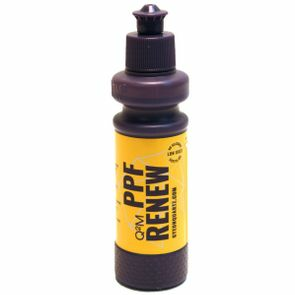 Q²M PPF Renew combines light abrasive particles with protective (and repellent) additives, creating resistant and highly self cleaning finish. The product allows both machine and hand application, removing haze and oxidation while leaving a smooth, glossy and repellent finish. It is the world’s first maintenance product containing silica and designed from scratch to work at its best on all types of PPF, including modern self healing films. Even high quality self healing paint protection films can become contaminated, dull, and lose its initial smoothness over time. Gyeon Q²M PPF Renew brings a remedy to that. With its light abbrasive properties, it is able to dramatically improve the level of gloss. The cleaning action of the product allows the removal of bonded contamination deep in the porous structure, restoring the initial slickness and smooth feel of the film. Q²M PPF Renew is the world’s first SiO² infused paint protection film maintenance product. Containing silica, not only does it restore gloss and slickness, it also does provide great repellency combined with UV and chemical resistance. Use a soft finishing pad on a low RPM setting, work until only a light haze remains. Buff with a soft microfiber towel until full gloss. GYEON Q2M Bathe Essence - 400 ml.